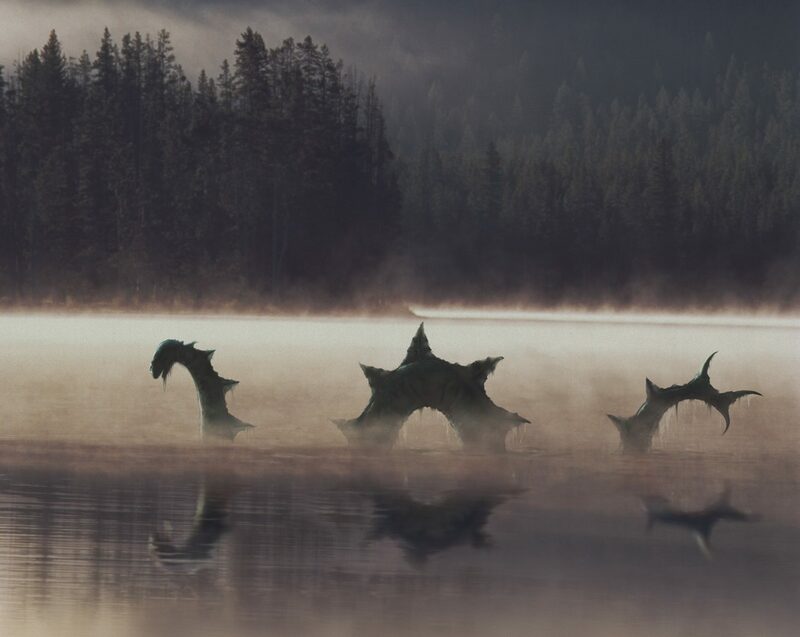 There are currently 200 documented testimonies from a total of 500 people who say they have seen the Lake Monster Storsjöodjuret. Many more have spoken orally about their experiences, but haven´t come forward with a written testimony. There are probably a great number of people who have seen unexplainable phenomena in the dark waters of lake Storsjön but haven´t dared to come forward at all. Could all these witnesses be wrong? The first known written evidence of the existence of an extraordinary animal residing in lake Storsjön dates back to 1635. A church minister named Mogens Pedersen from Herdal wrote the statement. It tells about two trolls, Jata and Kata, who cooked a witch brew at the shore of lake Storsjöns. When they had boiled the brew for many many years, something started to move and quiver in the cauldron and a big bang was heard. The statement further says that the beast was later cast under a spell and the formula was cut into a stone, and many believed this stone to be the Frösö Runestone – since it has a long wormlike monster on it. The years have gone by and no one has yet been able to prove that there really is a monster lurking in the depths of lake Storsjön. But on the other hand, no one has been able to prove there isn´t one… Some say that the beast has humps on it´s back and a long pointed tail. Others say that the beast is green and has white dots, and that it lays eggs every year. But everyone says that the beast is a nice beast. It is our own lake monster and the story is a part of the people of Jämtland Härjedalen. By the southernmost tip of Lake Storsjön there is a small community called Svenstavik. By the community grocery store and next to the liquor store there is an interactive research and visitor´s center for all curious to know more about the monster. The center is always standby in case there is a monster sighting via the monitors on the bottom of lake Storsjön. Young and old researchers are welcome to sit down by the large tablelike touch screens to find out all the known facts of the monster. In one corner you can watch films of true witnesses telling their stories and you can draw your own monster, process it through the “Monster Making Machine” and see your own monster swim off on the wall of the center. “- I feel a bit confused when the story of my family comes up, but from what I have gathered, we have lived in this lake ever since Storsjöbygden evolved after the most recent Ice Age. It should be about nine thousand years ago; time goes fast when you are under water as we Storsjö Monsters say. We like it here, and always have. There are only four lakes in Sweden of larger size; this one has just the right depth with an average of just over 17 metres; we have great neighbours and mates in the form of the 20 species of fish that we socialize with. My old ancestors – and now we’re talking seriously old – have described how, when they were young, hardly any people lived round the lake. Today the situation is quite different. People have moved here, farmed the land on the shores, built towns and bridges, so nowadays we are most happy in the winter when we can retire and hide underneath a thick layer of ice. I must admit it is a bit disturbing during the winter season with all the snowmobiles and all the shouting and laughing along the many tour-skating courses immediately above our heads, as we try to nod o and go to sleep. But the noisy winter people sound like they’re having fun. And they must, just like us, be happy in this environment. From what I’ve heard we are a bit famous, a cultural heritage, a trademark, intimately connected with Lake Storsjön and Jämtland. At the beginning of the 2000s a hugable, green figure was born with big eyes, small ears and a fairly long tail. 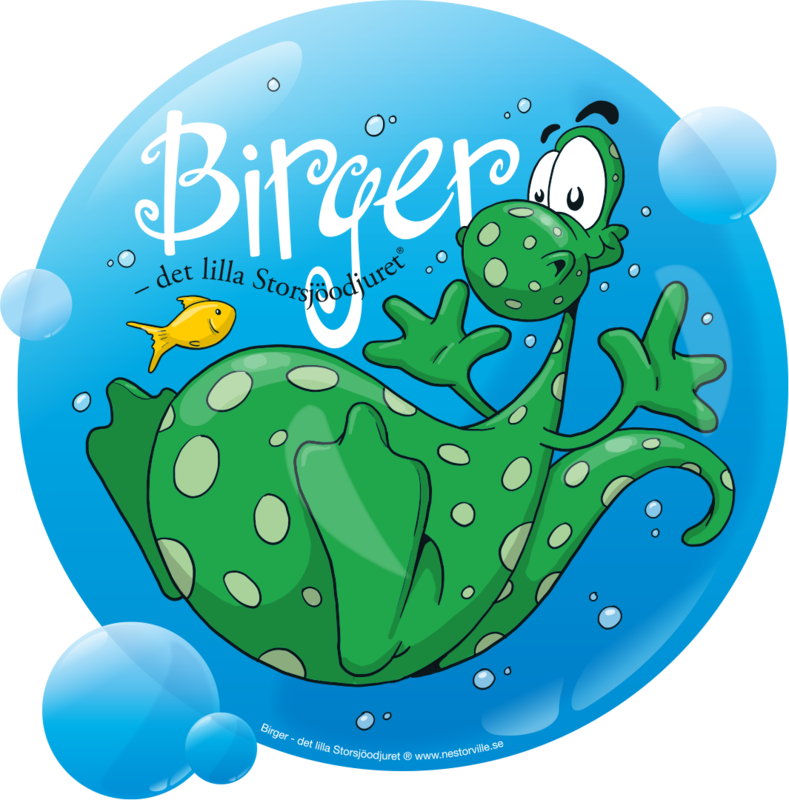 His name is Birger, is green with white dots and has a BFF called Gula Fisken (Yellow Fish). There are a number of books in which you can accompany them on different adventures. The favorite food is green marcipan clad Princess Cake and he likes to do mischiefs (nice ones) in the communities around lake Storsjön. Don´t be surprised if he shows up at an event – he just loves to hug and dance! At the museum Jamtli in Östersund visitors can go sliding through the belly of Storsjöodjuret downstairs to the exhibitions. In the Storsjöodjurs exhibition there are, among other things, the giant iron trap that was once used to attempt to catch the Storsjöodjur. The trap was then baited with a pig, luckily with no success. Around lake Storsjön there are eight different official Monster Observation Spots (Storsjöodjursspaning). At these sites, previous witnesses have seen the Storsjöodjur pass by. The place at the Sunne churchyard has a metal sculpture of the Beast and a mini exhibition in a small barn. At Rödön there are monster tracks to follow from the former ferry position and a bit towards the remains of the fortress Tibrandsholm. In Hallen there is a wind-driven device for attracting monsters and in Håkansta there is a giant camera and a set of binoculars to search for the monster with and climb on. At the church of Hackås there is a wall painting, the scene depicting when some farmers saw the beast, and at the lookout on mount Hoverberg you can search for church towers and lake monsters at the same time. In Trångsviken there is a fountain with eggs from the lake monster and in Vallsundet you can take a photo of Östersund city through the beast’s silhouette.